St. Patrick’s Day was a month ago, yesterday. I’m still reeling from it! We threw a party, like we always have. I will be the first one to admit that it really is just another excuse to drink. I won’t deny the purpose of our parties, but it also has a deeper meaning for me too. First up, is that my Dadda was born on this day! I have fond memories of going to Macayo’s every St. Patrick’s day. My mom and dad would get their green margaritas, and I would get my virgin Piña Colada. Green, of course!! Secondly, like I’ve mentioned before, I got a chance to actually GO to Ireland when I was a part of the CSUSB Chamber Singers. I had the time of my life! I kissed the Blarney Stone even! Before I acquired the “gift of gab” from the legendary stone, I had a meal at a pub nearby that made such an impression on me, that I’ve tried to re-create the dish many times over. This was WAY before I was a food blogger, and had the wherewithall to actually snap a shot of the dish that inspired what you have before you today. Maybe I didn’t know how great it would be. The Irish seem to really love their salmon!! I’ve tried, and tried to re-create this dish. I’ve tried to make it healthier by baking it, etc. The truth is, you have to fry. You just have to! You don’t get the same sheer satisfaction. The ultra-crispy interior. ..the creamy potato center with large chunks of fish. The light onion flavor from the scallions, and the sharp tang from the aged cheddar!!!! We haven’t even gotten to the hollandaise yet!!!! Tangy, silky, spicy, DIVINE sauce… Oh, how I love thee!!! THERE’S THAT CRUNCH AGAIN! I’m super thankful that I have six more of these in my freezer. This is a dish that I had in Ireland that I fell completely head-over-heels for. Now, you can have it too! Peel and cube the russset potatoes into 1½ inch pieces. Add to a medium sized pot, and fill with water until the potatoes are covered. Heat over high heat until the water boils, then reduce to medium-high heat, until the potatoes are fork tender, about 10 – 15 minutes total. Drain the potatoes, and add the butter, salt, and milk, beating with a hand-mixer until smooth. We only need three cups of mashed potatoes, so if you have more, reserve that for another use. Flake the salmon with a fork, and add to the potatoes along with the scallions and shredded cheese. Form into palm-sized disks, and set aside on a parchment-lined cookie sheet. Whisk the eggs together in a shallow bowl, and set aside. Portion the Panko bread crumbs onto a lipped plate or shallow bowl and set aside. Now, we’re ready to coat the croquettes! Dip the disks, one by one into the egg mixture first, then coat with panko bread crumbs, and return to the parchment-lined cookie sheet. Repeat until all disks are coated. At this point, you can freeze the croquettes until you’re ready for them! If you have frozen them, let them thaw at room temperature for at least an hour before frying. Heat a skillet with about a half inch of canola oil under medium-high heat. When the oil has come up to temperature, fry the croquettes in batches until golden brown on each side, about 2-3 minutes per side. Reserve to a paper towel lined plate. Fill a small pot halfway with water, and heat over medium heat. Place a metal or glass bowl over the pot, so it does not touch the water, and add the egg yolks and lemon juice. Whisk continually until the eggs begin to thicken. Turn the heat down to medium-low, and add the butter cubes one by one until each one is melted before adding another. Remove from heat, and add salt, and cayenne pepper. 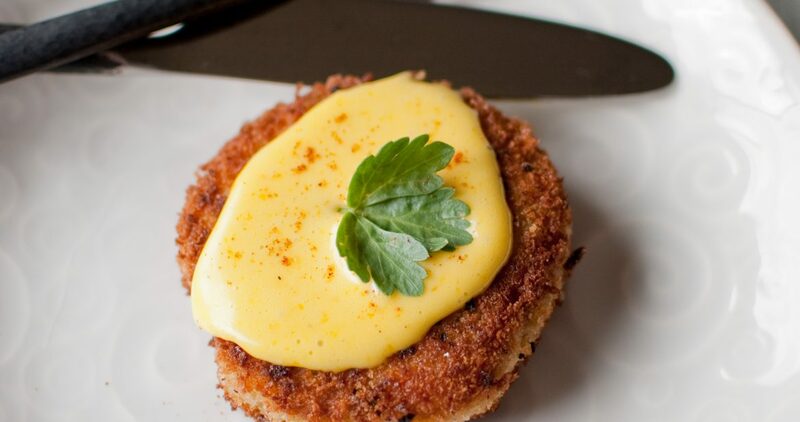 Place a dollop of Hollandaise on each croquette, top with a parsley leaf, and serve immediately! It’s salmon time ’round these parts and I am lucky enough to have a co-worker that likes to fish. So when I get my hands on some local, fresh salmon I will be giving this recipe a try. Awesome, Susie!! Let me know how they turn out! Oh that looks so delicious. I love your Ireland photos as well. I love the sound of your salmon croquettes, thanks so much for the recipe! OOooo smoked salmon sounds GREAT for these!! I’d love to know how they turn out! So lovely to meet you at Potluck… This is a great recipe, love the photos, they look so crispy and crunchy! Louise, it was fantastic to meet you as well! Hopefully our paths will cross again very soon!